Schools and academic bodies are confronted on a daily basis with incidents that could develop into full blown crises, if the proper management steps aren't in place. These could include severe weather, disease outbreaks, technological breakdown, and of course, violence. That means institutions need a range of diverse, and complex crisis management plans, which can be difficult to execute with traditional, manual methods. We've previously discussed why educators have a greater duty of care in preparing for critical incidents. Let's take a closer look now at how technology can provide a decisive advantage in preparing an effective crisis response. - Identify and train a spokesperson — a key spokesperson needs to be identified, prepared and kept as up to date as possible to ensure that the media, staff, customers and the public are kept informed with a clear, consistent message. - Honesty and openness — in our connected age it’s no longer possible to hope that information can be kept from the media or public, so a policy of openness and transparency is essential to maintaining trust. - Keep employees, community and stakeholders informed — information on any crisis should reach your broader community, including staff, parents, neighbouring schools, and education departments directly from you, and not from the media. - Update early and often — be proactive and early with sharing news, even when the whole picture isn’t clear. It is better to over-communicate than to allow rumours to fill the void. Start with summary statements on whatever is initially known, and provide updated action plans and new developments as early and as often as possible to stay ahead of the 24/7 news cycle. - Social media – ensure that all the channels that your stakeholders may be using are covered, not just the traditional areas in which critical statements were released, such as press releases or the company website. - Establish Notification Feeds and Monitoring Systems – staying informed and knowing what is being said about the company beforehand is essential to staying ahead of unfolding events. Monitoring systems allows companies to gather intelligence from a range of sources to keep informed and stay ahead of unfolding negative situations or sentiment.Read our Inside Guide to Crisis Communications for a detailed overview of each of these key points. When an emergency occurs, a range of stakeholders need to be alerted and updated, including staff, parents, neighbouring schools, emergency responders and related government bodies. Best practice crisis communications tools include a centralised portal which is accessible by all required parties, feeding real time information on unfolding events to facilitate a coordinated response. Emergency response apps can be tailored to the needs of the user. Students, for instance, can use a one-touch activation to call for security assistance, if threatened, and GPS locators can help responders reach them fast. Send messages to staff and stakeholders in the way that suits them, whether that’s voice, SMS, Social Media, Rich Messages or email, to improve the rates of delivery and acknowledgement. Knowing they will almost always have their mobiles close allows organisations to provide messages on all these channels. Geolocation can segment communications even further, such as providing multilingual messages appropriate to the recipient’s location or pre-defined contact preferences. Message templates should be prepared with specifics that can be rapidly used or altered during incidents, thereby ensuring approved language, structure & consistency, while saving time by providing pre-defined communication and response options. When urgent communication is required, choose the correct channel to meet requirements. SMS accelerates the speed of notification - whereas half of all emails aren’t opened for at least six hours, the average text message is accessed within a few minutes and responded to within 30 minutes. Voice calls to mobile and fixed lines generate an even faster response, and can be created to trigger automatically from the communications platform. Best practice Crisis Communications programs are built around cross channel communications platforms, that provide interactive, responsive communications, comprehensive reporting and message delivery status transparency for key staff and senior stakeholders.Communication and workflow automation, combined with integrated monitoring systems, provide BCM leaders with a unique and powerful opportunity to plan and execute and streamline critical communications. Whispir’s advanced communications platform allows Departments, schools and emergency services to all be kept continuously up-to-date on developments, whether the incident affects just one school, or a larger area. Staff, students, parents, the community, emergency services, other schools, and the media can be reached simultaneously with actionable SMS, email, mobile apps, voice and social media to help keep everyone safe. For more detailed insights on this topic, read our Inside Guide to Crisis Communications for the Education Sector. 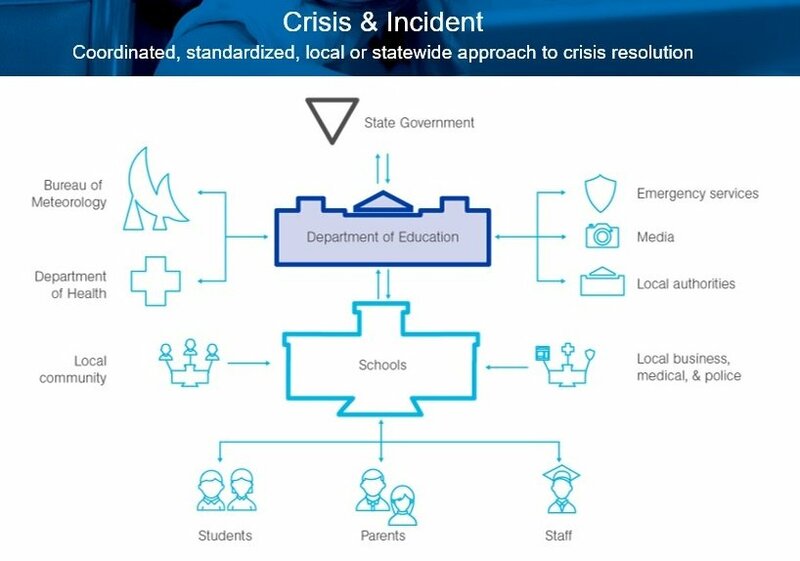 The guide collects our insights, tactics, and best practice use of communications technologies in supporting proactive and effective education crisis management. Or contact one of our specialists today to discuss how we can help with your crisis communications preparation.